Man is a born child, his power is the power of growth.Wishing every happiness will always be with you. - Various colors available. Each child deserves a colorful childhood, a color,a smile. Donot hesitate to choose the colors you like. - Whole body is made of soft silicone without any metal parts. Comfortable and durable even during strenuous exercise. 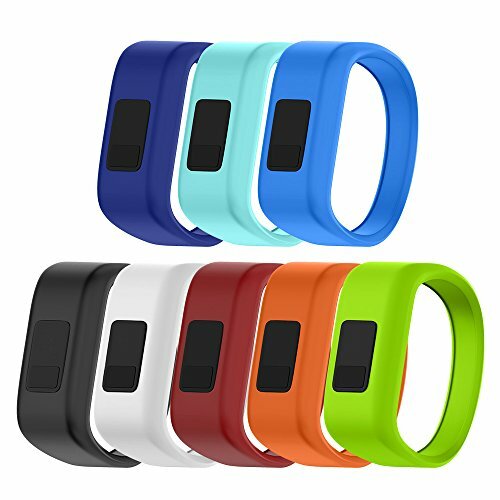 - Perfectly fits Vivofit JR, precise moulded bands. Bands are tested one by one before packing, good enough to hold the device. - Eco-friendly material, no strange smell. Harmless to skin, it's light weight and won't affect your movement. If you have any question about our item or service, please donot hesitate to contact ANCOOL. We're glad to hear any suggestion from you. And we'll do what we can to solve your problem efficiently and satisfactory. Comfortable and lightweight silicone material, which is conducive to blood circulation. Children will simply couldn't part with the wristband. Rich in color. Various colors available to wait for your choice. A nice way to make children's world more colorful, increasing their sense of color as well. Our bands fit in with human ergonomics design, arc perfectly fits children's wrists. Special design for your children. Small size: 5.7inches [145mm], Large size: 6.7inches [170mm]. Fits most kids age at 4-8. Lifetime Customer Support. 6-month warranty and lifetime tech support. We are happy to resend a replacement band or accessory if there's any quality issues of the band. Please kindly contact us once there's any technical problems or quality issues. We're always here for you. If you have any questions about this product by ANCOOL, contact us by completing and submitting the form below. If you are looking for a specif part number, please include it with your message.